Tri-tip steaks are a coveted cut of beef due to their rarity and flavor. 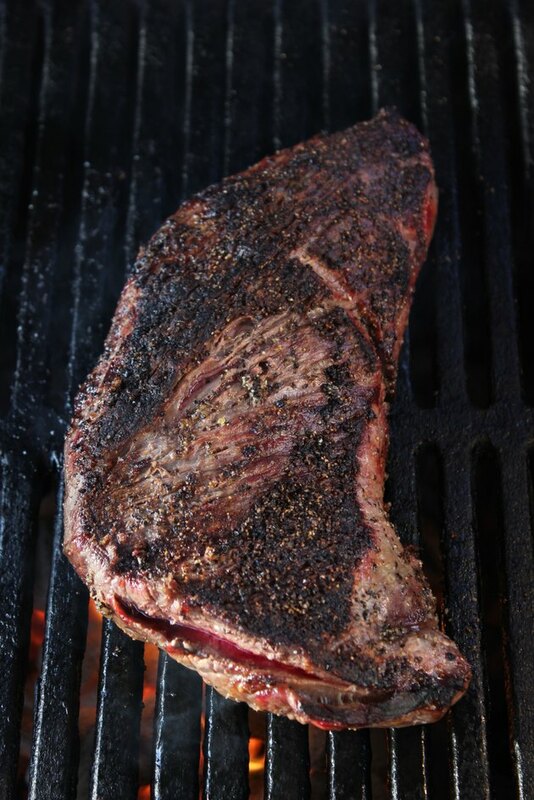 In a July 2010 article for "The New York Times," Mark Bittman writes that there are only two tri-tips in an entire cow. Cut from the bottom of the sirloin region, the tri-tip's thickness and marbling produce a richly flavored steak. By preparing a tri-tip on a propane-powered gas grill, you have better control over the grill's heat and the finished product. Ignite all of the burners on your gas grill, close the lid and allow the grill to heat for 15 to 20 minutes. Ideally, you want your grill to reach an internal temperature of 500 to 550 degrees Fahrenheit. Season your steak with salt and pepper. Tri-tip steaks are well-marbled, and this internal fat will create a rich flavor. According to grilling expert and author Steven Raichlen, salt and pepper enhance the flavor and provide a crust to prevent moisture and flavor loss. Lower the burners on half of the grill to medium. Set the steak on the high-heat side and cook 4 minutes on each side to sear. Move the meat to the low-heat side of the grill and cook 6 to 8 minutes on each side, or until an instant-read thermometer inserted into the steak reaches 120 degrees Fahrenheit. Remove the steak from the grill and let it rest at room temperature for 10 minutes. The steak continues to cook while standing and will come up to 125 degrees Fahrenheit, which is medium rare. "The Barbecue! Bible"; Steven Raichlen; 2008.